According to Over the Monster via Jim Bowden (see tweet below), Corey Hart's agent says the Red Sox have shown interest in Hart, as well as the Tampa Bay Rays, Colorado Rockies, and the Milwaukee Brewers. Hart had a knee injuries in both knees that cost him the entirety of 2013, so he would supposedly get a make-good contract, much like Mike Napoli had in 2013. So, if we lose out on Mike Napoli (I hope I didn't just jinx it), his offensive numbers would be good enough to compensate for what Mike Napoli brought in 2013. 2010-2012, Hart put up 31, 26, and 30 home runs respectively for the Brewers before missing this past season as well as slash lines of .283/.340/.525, .285/.356/.510 and .270/.334/.507 in 2010, 2011, and 2012 respectively according to ESPN. Pretty solid numbers right there. Plus if Napoli signs with another team (still hoping that doesn't happen!) we'll get a draft pick out of it, so we'd have that to work with. This is all still hypothetical, and it is unclear what they'll do with Mike Napoli, though both sides have made it abundantly clear that there is a mutual interest in bringing Napoli back to Boston. 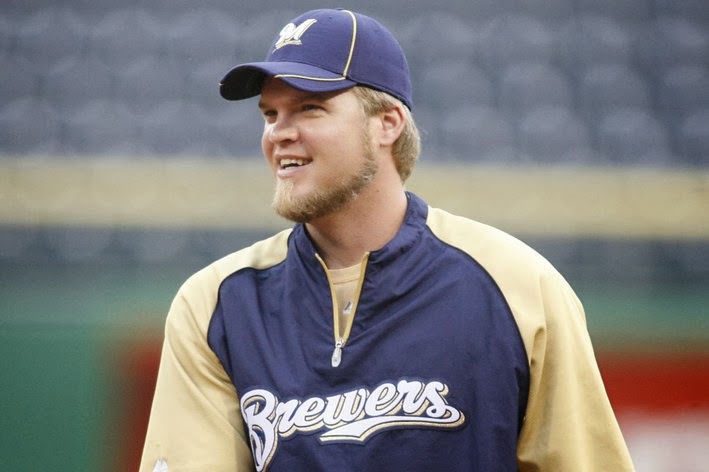 BUT if we do happen to lose out on Nap, Corey Hart would be a solid replacement stats-wise. Thoughts? Tweet me or leave a comment.